Manchester University Foundation Trust is a leading teaching hospital Trust for developing clinical academic careers amongst Nursing, Midwifery and Allied Health Professional (NMAHP) staff. A dedicated team lead this work, forming a close collaboration between the Trust and The Division of Nursing, Midwifery and Social Work at The University of Manchester. 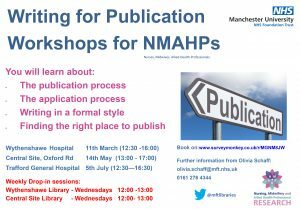 We have held seven consultation events at the MRI, Trafford and Wythenshawe hospital sites to develop a new MFT NMAHP Research Strategy. Over 150 staff have attended these events. 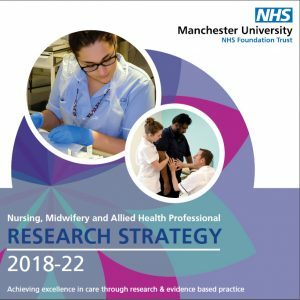 The strategy was launched at the MFT NMAHP Research conference on 11 May 2018. The latest edition of NHS Wonder Women features our very own Dr Helen Hurst, Consultant Nurse, Older People and Frailty, at Trafford General Hospital. In this short film Helen tells us that “now is the right time” to get involved in research and realise that women do make a difference and do need to be recognised. Listen to Helen talk about her perfect role where she can be both nurse and researcher. Hear about Helen’s love of laughter and her passion for clinical work. Be inspired by one person’s 30-year journey in nursing and see what can be achieved. The NHS employs around 286,000 nurses and health visitors, 89% of which are women. 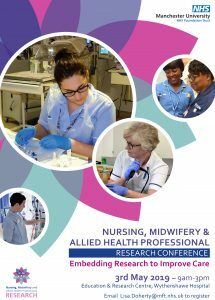 Despite this large number of women in the nursing profession, they are still a minority in senior health and social care research roles. Nursing research is a vitally important emerging and growing field and allows nurses to be better advocates for patients and provide the best care possible. Education and Research Centre, Wythenshawe Hospital. The Pre-Doctoral Clinical Academic Bridging Fellowship is aimed at practitioners seeking to undertake Doctoral studies to further a clinical academic career. The Fellowship offers 50% backfill up to 1 year (maximum of £20,000). Expected outputs to include a Doctoral application for funding and a submission for publication. The Fees Only Doctoral Fellowship is available to Consultant NMAHP staff only. A confirmation of Doctoral study eligibility is required from a Higher Education Institution as part of the application process.